With these ominous words from an ancient curse, so begins the nightmarish outback odyssey that is Wake In Fright (1971). Based upon the 1961 novel by Kenneth Cook, Wake In Fright tells the sorry tale of school teacher John Grant (Gary Bond), who eagerly awaits his end-of-year vacation from the single classroom school where he is contracted. The school is located in Tiboonda, an outback dustbowl so small that to call it a town would be most charitable. For his summer holidays, John plans to travel to Sydney by way of Bundanyabba. The Yabba, as it is more commonly known, is somewhat larger than Tiboonda (which isn’t saying much), where the main activities seem to be drinking, gambling, more drinking, and more gambling. John, a well-mannered, prim and proper sort, belongs in The Yabba about as much as a hamster in a lion’s den. But no matter, John’s trip to The Yabba is merely an overnight stop en route to the salubrious beaches of Sydney – or is it? No, for if it were, this would be a very short story – and a much happier one. Everything that can go wrong does go wrong for John Grant as he finds himself staying in The Yabba longer than expected, confronted by the unsettling “hospitality” (read: passive aggression) of the locals, and very much done in by his own foolishness. But maybe John will get to Sydney after all… if the waking nightmare that is The Yabba doesn’t get him first. 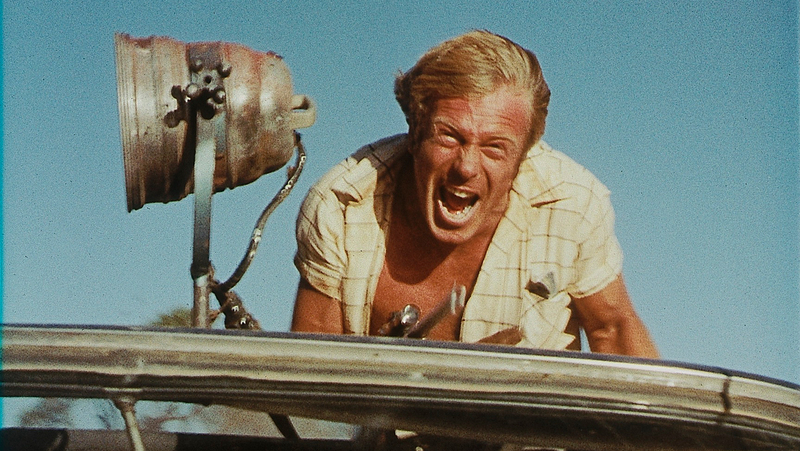 Forget about your picture postcard portrayals of Australia, because Wake In Fright is possibly the most unflattering depiction of life in this country ever committed to film. Under its entry in Leonard Maltin’s annual film guide, it is said that Wake In Fright is not likely to be endorsed by the Australian tourist commission. So one can know if the folks in the Oz tourist trade were relieved when Wake In Fright disappeared from cinemas for many years (until a restoration from a 16mm print courtesy of Jamie and Aspa at Mu-Meson, brought it back to the big screen in 2009), because if the misadventures of John Grant were viewed as widely as the adventures of Mick ‘Crocodile’ Dundee, potential travellers Down Under would be staying away in droves. 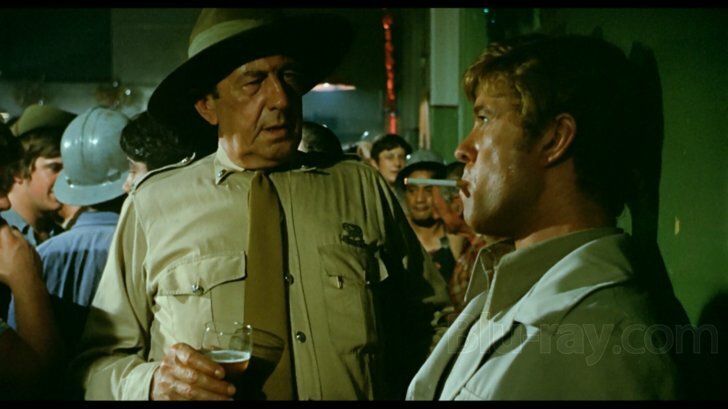 That said, if I had a short list of Australian films to recommend, particularly to visitors from overseas, Wake In Fright would be on the list. The character John Grant is clearly an outsider looking in, so it’s only fitting that he is portrayed by a foreigner (Gary Bond was English, as is his Grant), and even more appropriate that the film was directed by another outsider, Ted Kotcheff, who is Canadian. Following on from Wake In Fright (released with the title Outback in the United States), Kotcheff stood at the helm of the American football classic North Dallas Forty (1979) and the celluloid debut for the John Rambo character, First Blood (1981). He is no stranger to crafting brutal, disturbing cinema. It is only fair to warn potential first-time viewers that this film contains an extremely harrowing kangaroo hunt sequence (as a long-time vegan myself, I found this especially disturbing). So I can only imagine how grotesque the experience must have been for Ted Kotcheff, himself a vegetarian at the time, now a vegan, as his cameras followed one of the regular night-time kangaroo hunts through the Australian outback. Much of the footage acquired was deemed by Kotcheff himself as being far too graphic to show an audience (I shudder to think how that must look). So long as you can withstand the sheer brutality of the infamous kangaroo hunt sequence, Wake In Fright is a most rewarding exercise in existentialist cinema, one that rivals Sam Peckinpah’s Bring Me The Head of Alfredo Garcia (1974) for the title of grimiest, sweatiest film of all time – you can see the dust and perspiration settling on the screen. Gary Bond is superb as John Grant; with flawless verisimilitude, he portrays a man who, due to his unfavourable surroundings and circumstances, regresses from his civilised self into something more closely resembling a borderline savage. Wake In Fright also boasts a memorable performance from Donald Pleasance as the dodgy town doctor, in addition to appearances from Chips Rafferty (his final role in a feature film) and Jack Thompson (one of his earliest). The film takes place in a “bloke’s world” – it’s one of the blokiest films you could imagine, full of fistfights, gambling, shooting and boozing. There are few females in the film, and Janette (Sylvia Kay) is portrayed with derision. This opens the door for the aforementioned aggressive male bonding rituals shown in graphic detail. There is also intimate male bonding that is only ever implied, though no less bewildering, given the circumstances. Wake In Fright is a powerful film not only because of what it shows, but also for what it suggests. Recent years have seen a surge of popularity for the horror genre, but if you want to see a real horror story, forget about vampires, werewolves and zombies: Wake In Fright is the real deal, all the more disconcerting because this sort of thing could and does really happen. It is indeed a rare opportunity to catch the film on the big screen, in 35mm print format, an event that no ardent cinephile should miss. And if you haven’t already done so, do read Kenneth Cooks’ novel, a short if worthwhile read to be digested in one sitting. May you dream of the devil… and wake in fright. Written by Astor regular Mark Vanselow.